Lo... THERE SHALL COME... THE DEFENDERS! WHAT LIES WITHIN : DEFENDER. An early wish for a HAPPY THRASH-GIVING! 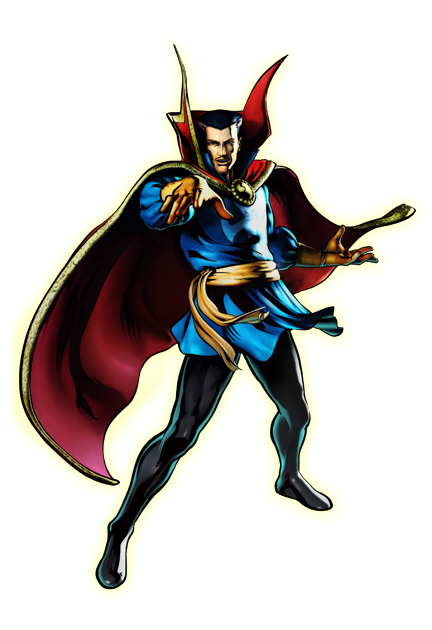 DR STRANGE a playable fighter in U MvCC3! But, Lo! There has come a reason to be thankful this Thanksgiving... the gift of THRASH! and at the base of his shoulders, leading down and around the outside border of the cloak. So, while it is sad (and annoying!) that I purchased the deluxe version of Marvel vs Capcom 3 only a few scant months ago (as blogged about [HERE]) I feel it is "worth" it to finally have Doctor Strange as a playable character in this game (as opposed to just making a lame cameo appearance, like he did in the prior release, along with other blog favorites like MAN-THING). And at a mere $39.99, it's not all that bad. Add to the fact that there are still some free bonus swag to get if I preorder. Good thing I'll be able to pull out the HAND of HOGGOTH to put the smack down on whomever pisses me off! Cover art to issue # 1 by Terry and Rachael Dodson! Being unable to physically attend the Con (as I'm on the East Coast, am generally lacking the funds for such a trip and am nursing an illness) I instead linked up to their webcast videos and news posts, waiting for the news from the 'Fear Itself' panel - waiting for news on what is to come for DOCTOR STRANGE and the other "6-Dimensions" characters. In this case, specifically those presented in the teaser images I posted here the past few days (most recently - [HERE]) . Suffice it to say, and I'm sure it can be found fairly easily at most of your major comic news sites, if not already, then any second now... but I was forced to play video, pause it and grab this image of the announcement as well as the cover image seen above (Edit: I have been able to replace the cover image now with a better quality as it does now appear on sites like CBR [HERE]). Written by Matt Fraction with art by Terry Dodson, the Defenders not only features the characters that were presented in the aforementioned teaser promos, but also a changing guard of other heroes, much like the non-team assemblage of old. 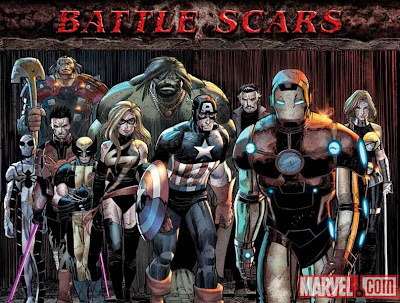 Fans of the original team will be thrilled to know that NAMOR; the SUB-MARINER also joins other original members; SILVER SURFER and DOCTOR STRANGE as they, and other new members, IRON FIST and RED SHE-HULK join to help the HULK who is in desperate need of their aid. As it seems, there is a huge mystery of cosmic importance that the Hulk brings to these "friends" and he requires their aid to solve it and deal with it. 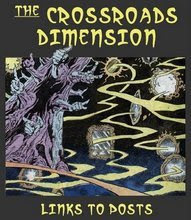 However, the mysteries will be of such immensity that the members of the team will find themselves unable to speak of any of it to ANYONE other than members of the DEFENDERS! Much like the Marvel ILLUMINATI, which Strange and Namor were a part, the DEFENDERS will also shoulder unbearable burdens to which no one else may be privvy. With all the animosity and problems that exist recently between all the members of this team, as well as the mystery of IRON FIST's allegiance to AGAMOTTO (as seen in issues of NEW AVENGERS (review found ([HERE]) and the recent issue # 7 of IRON MAN 2.0), this is going to be one heck of a tense team of heroes. VERY much a MARVEL team. Very much like the classic DEFENDERS! Perhaps, I shouldn't be saying anything negative at this early stage, but the artwork shown on that Defenders cover looks to be of pretty poor quality. I've seen the Dodson's art on Spider-Man and X-Men titles and it usually comes across as more... polished... than this. As it stands, this cover image looks like the same rushed "quality" of the old "SECRET DEFENDERS" issues by Tom Grindberg (whose work I liked... WHEN he took his time to do a crisp job of it). Still, this may not be the "final" image, as some glitzy coloring, or finished inks, might help it out somehow. ALSO of note, is that while this spins out of 'Fear Itself' it also bears watching because of the membership's ties to other "link-ups" being promoted at Marvel. ... as well as having DOCTOR STRANGE be a part of something that also spins off of the event; "BATTLE SCARS", which, like the "INITIATIVE" will be an ongoing title showing what happens to these major players of this 'Fear Itself' battle. Note, the ORIGINAL, UNEDITED version of this image - as was seen at the Con, and subsequently, on the video feed featured THOR (or someone looking like him) in the top left corner. As an added bonus, Valkyrie appears to play a big role as a member of the MIGHTY as well as this BATTLE SCARS crew. Interested? Intruiged? Looking in eager anticipation for December? To get some hopefully good stories featuring Doctor Strange in several titles... I'll be a VERY good boy and wait for Santa to drop these issues down my chimney! IN PREPARATION FOR THE DEFENDERS! While originally intending to post this within a day or two of my most previous post, I felt that it could wait until it was closer to the actual "reveal". 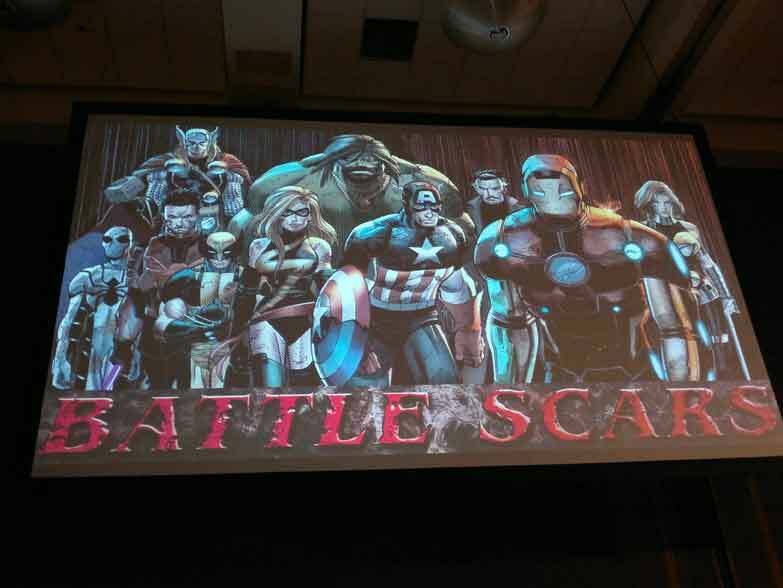 Anyway, as written in my last post ([HERE]), we all saw the various teaser images that alluded to the gathering of several characters in the post "Fear Itself". They were DR. STRANGE, SILVER SURFER, RED SHE-HULK and IRON FIST. While the meaning of the various wordplay images might differ from person to person, I feel fairly confident that it's all right there in the teaser itself - especially the caption; "It's Either IN you or It's NOT." And the only word that is IN all of the characters is DEFENDER - except for the outlined figure of the HULK - within whom it does NOT. So, to me, it's that Hulk is the rogue agent who is the initial catalyst for these four Defenders to unite. 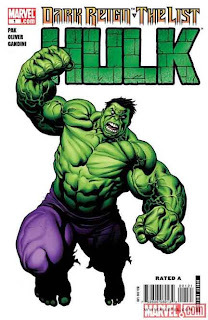 Whether Hulk is to be a long-term bad guy or just gone off the rails (yet again) is not certain. But what is certain is that these teasers have long-time fans of the classic "non-team" chomping at the bit. So, until the Comic-Con event officially sheds some light on this project, allow me to illuminate a little on the mystery of the teaser images. "The Last Shall Be First"... well, the HULK image was the last to be revealed, and it is presented below alongside the actual comic image from which it was taken. 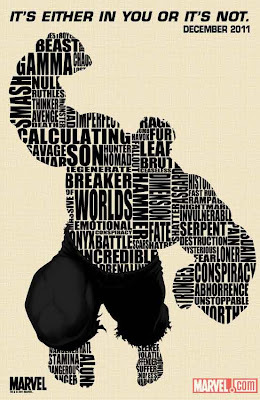 It's been questioned as to WHY the Hulk's pants are black (those people swear that it is to be the RED HULK, but RULK is known to be occupied in the coming months)... and the answer is hidden in the word jumble of this Hulk. Something happens to HULK and he undergoes another color shift... this time to ONYX HULK. Fans question the reasoning as to why a fairly "low level" character like Iron Fist is to be in this line-up. I believe it has something to do with his new ties to AGAMOTTO. (as last seen is issues of New Avengers - review of same ([HERE] - although there are others in that series. All within a post of each other.) as well as the newest issue of Iron Man 2.0 # 7. 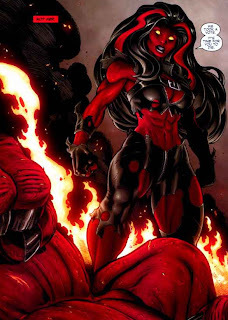 Red She-Hulk will be drawn into this fold by the very nature of the fact that she is the Hulk's ex-wife and wished to be there to help him (or hurt him bad!). A classic DEFENDER, it is good to see the Surfer back with his compatriots on this fairly "Earth-based" team. Doctor Strange's pose was taken from a fairly recent Marvel promotional art sample (what Marvel sends out to prospective vendors and manufacturers to use as production art). 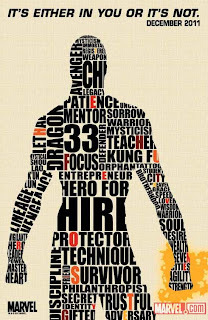 His lineage as the de-facto Leader of nearly every incarnation of the Defenders. His need to somehow fix things with HULK after the whole World War Hulk debacle. 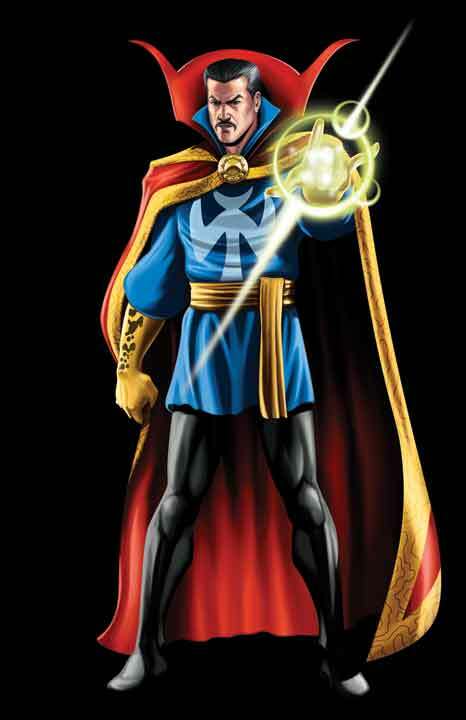 His slow rise to power and reclamation of same after losing his position as Sorcerer Supreme. 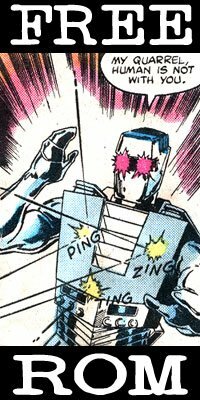 His big role (soon to be seen) in the end of FEAR ITSELF as one of the MIGHTY (a grouping of which many of these Defenders are also comprised). To get him away from BENDIS! It's going to be a big spin-off to the AVENGERS, but one without the name of Avenger. For these are... THE DEFENDERS!!! 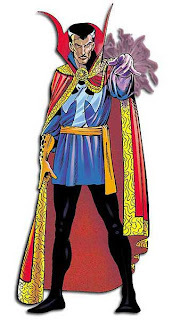 * Footnote: Incidentally, that Paul Smith illustration was used for most subsequent incarnations of the "Marvel Handbooks" as well, and up until only very recently when it was replaced by the photoshopped version, was very nearly THE representation of Doctor Strange to the outside world. The mystery of the teaser-images that Marvel has been releasing grows ever clearer. As I blogged about the other day - [HERE]), there have been daily teaser-images to a December 2011 event (?) that features characters shown only in outline, with descriptive words filling out the empty space within. ALL of them carry the same tag-line: IT'S EITHER IN YOU OR IT'S NOT. (Sadly, the poor design of this one ruins the series. There are several alluded-to verbal clues in each of these images. First of all, each character has various letters highlighted in 4 different colors. It has been found online there are four different messages hidden within. A very innovative puzzle from Marvel's promotional department (and, while really, anyone with a lot of time and minimum spelling skills could figure the solutions, we give kudos to those who have done so for us). It seems to be a dire warning of some cataclysmic event that will precipitate the union (or at least the participation) of these four characters (and perhaps others?). Are the lines to be read as a whole message? If so, the poor grammar would indicate more of a prophesy than an actual stated phrase. If not a unified message, is each colored message unique to members of this assemblage? And if so, how do we parse whose colored message is for whom? Also, how do we know that these 4-word phrases are complete? While it seems that these four are likely to be the whole coded message, complete...there could be more words remaining in each one. There is to be at least one more image forthcoming tomorrow (which I will post here as an update - or perhaps in its own post... we'll see). It could either be the full team assembled image, or yet another outlined character. Could this be the new DEFENDERS line-up? Would Marvel release a team book that isn't in some way linked to the Avengers brand? So, if so, perhaps the official team name may be the AVENGING DEFENDERS, or the DEFENDING AVENGERS? Why not the MIGHTY DEFENDERS? I don't know for sure, but I will say I'm eager to find out. And if this IS indeed a new roster for the DEFENDERS, it it a slight departure from Marvel's usual formulaic habit of filling the team. In times past, it was usual for Marvel to pattern each subsequent iteration of the classic "non-team" with either the same "big-4" original members; Dr. 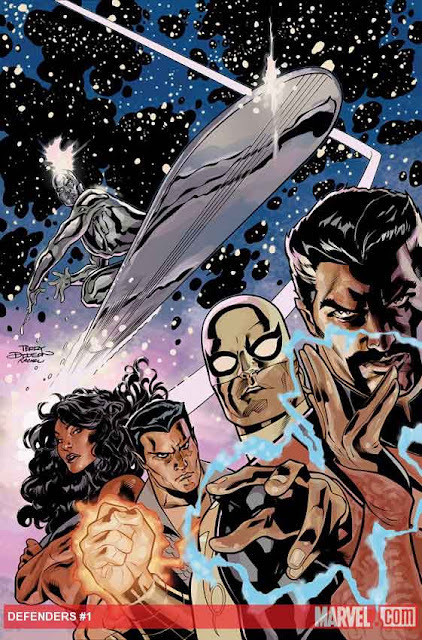 Strange, Namor, Hulk and Silver Surfer... or if any of them are to be replaced, it is usually with analogues. 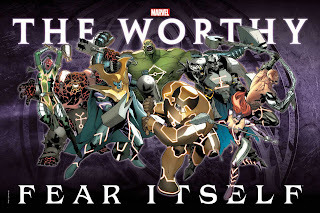 In the most recent cases; the "LAST DEFENDERS" used; Hellstorm, Krang, She-Hulk and Nighthawk (a new Nighthawk, but still based on one of the old teams classic secondary members), and in "Fear Itself; THE DEEP" (which was operating under the working title; "Fear Itself; The DEFENDERS - as the pencils for the original art attest), the team consists of; Dr. Strange, Namor, Savage She-Hulk (Lyra, an alternate-universe future daughter of Hulk and Thundra) and Loa (a mutant X-Man turned-Atlantean). So, how can marvel release a new Defenders line-up/ title if there are theoretically two other teams running around currently under that banner? 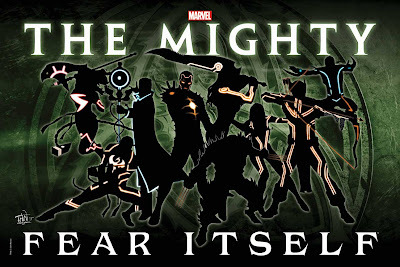 Well, "Fear Itself: The DEEP" is a mini-series, and like the Defenders classic mission-statement, is a by-product of there being a big-enough danger for one of the members to summon the others. 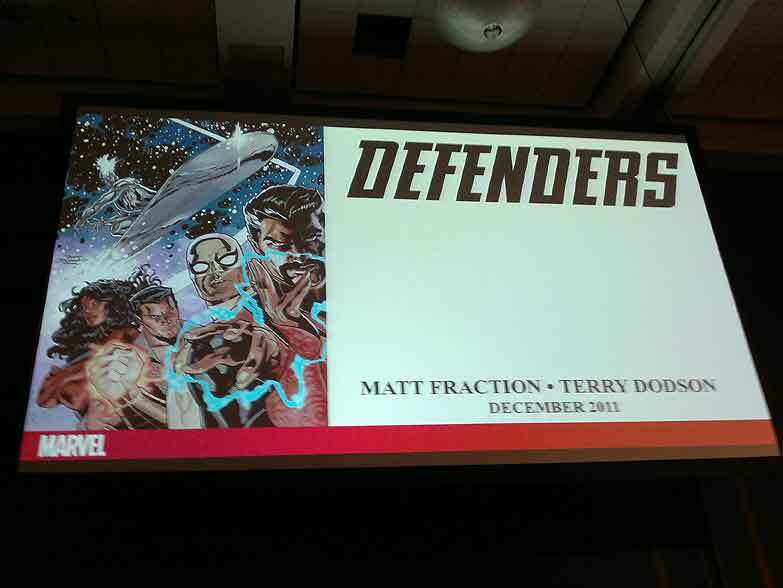 And the "Last Defenders" are technically disbanded, although they ARE appearing (perhaps in a non-current timeline) in the pages of the new mini-series; "Vengeance" (written by Joe Casey, their creator). Besides, if there can be umpty-umpth Avengers teams and titles, why not share the Defenders wealth? Aside from there being an apparent lack of the headstrong, brazen character-role that was filled by Namor, this is an interesting line-up. I must confess that I am a bit hard pressed to believe that this roster will remain for long. Fans of the Defenders want THE DEFENDERS. And whenever that line-up is not met, the fans tend to walk away. Iron Fist is a great character, but he's not the usual "fit". He's much more in line with the way Doctor Strange USED to be handled in the title. Learned, patient, spiritual. Red She-Hulk can fill Namor's headstrong role as well as Hulk's usual smasher role, so that is fine. Surfer and Strange are both drastically different characters than they once were as well. 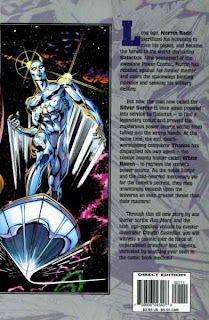 Surfer is now back to being the Herald of Galactus (unless that has changed in the past few months, of which I am unaware), and is of a darker-minded persona. Stephen Strange is also changed. Although the extent of which truly depends on whomever is scripting the character at any given moment. He has been shown to be sullen, depressed, and weakened by his loss of the "Sorcerer Supreme" mantle in one title, and then capable, upbeat and mystically adept in another. He is shown to be back in his classic outfit, complete with Cloak of Levitation, and a space for the Eye of Agamotto. 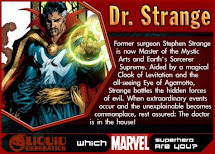 But these items had been lost to him over the past few years, along with the loss of his role as Sorcerer Supreme. The Cloak was given to his successor, Brother / Doctor Voodoo, as was the Eye of Agamotto. However, the Eye was supposedly destroyed (you can read my intense dissection of that event [HERE]), and the Cloak was left ownerless with the apparent death of Voodoo. Or are we in danger of being too literal in the visual representations shown? Is his image shown in classic garb to be the actual case, or is that look being used just to clarify who he is, since his current wardrobe is not distinct enough for the outline treatment? * Footnote: UPDATE: Hrm... It seems there is a word missing from Doctor Strange's image. That word is HERO. I thought I had seen it there when I wrote this piece, but after posting it, I went back in to check it and no... it's not there. Now, I don't know why the word HERO would be left off of Strange's image, but it is. A small nit to pick, but one that makes me wonder... is he REALLY a Hero (or at least, a SUPER hero)? I really don't like him to be portrayed as a "super-hero", often stating that he works best as a true sorcerer. But, still, even if he is a mysterious outsider who may cross paths with other super-folk while crossing dimensions to battle demons from beyond, he IS still a HERO. ** Footnote: There is one word evidently missing from Iron Fist's image. That word is MIGHTY. It appears in both; Dr. 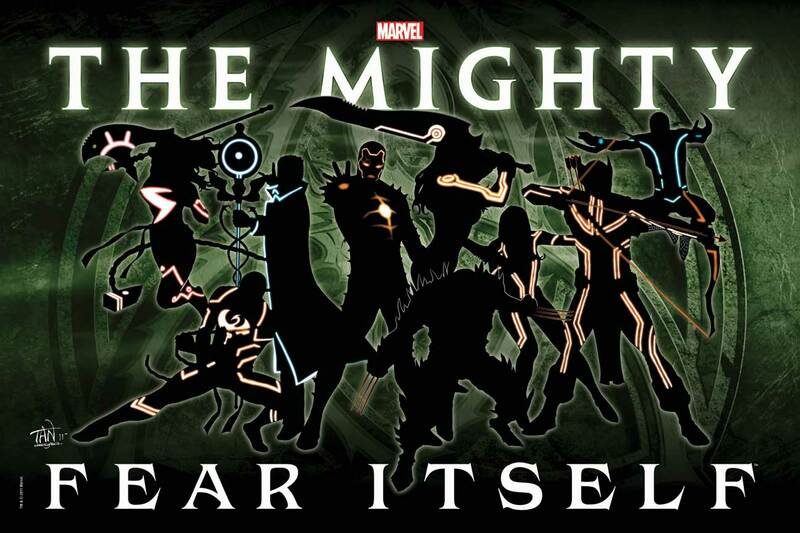 Strange as well as Red She-Hulk as they are both in the "MIGHTY" team from the wrap-up of the FEAR ITSELF event. 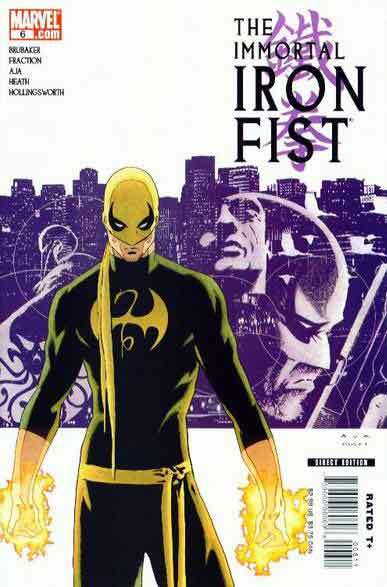 However, according to the teaser image (seen in my previous post [HERE], Iron Fist is as well. Still, a small slip up. One hardly worth noticing - except by the very nature of the images, you are meant to pour over each word looking for clues and meanings. 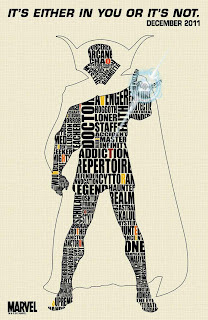 As such, I still wonder what the "3" stands for in the image of Doctor Strange. As I mentioned in the past post, Strange has a number 3 on his chin (under the symbol for infinity). But the "3" for Doc is curious. Could it stand for the Vishanti? They are a tribunal. But VISHANTI is a word that is shown in his promo image.... so what is the "3"? Can anyone think of what it might be? Feel free to toss ideas in the comments section. 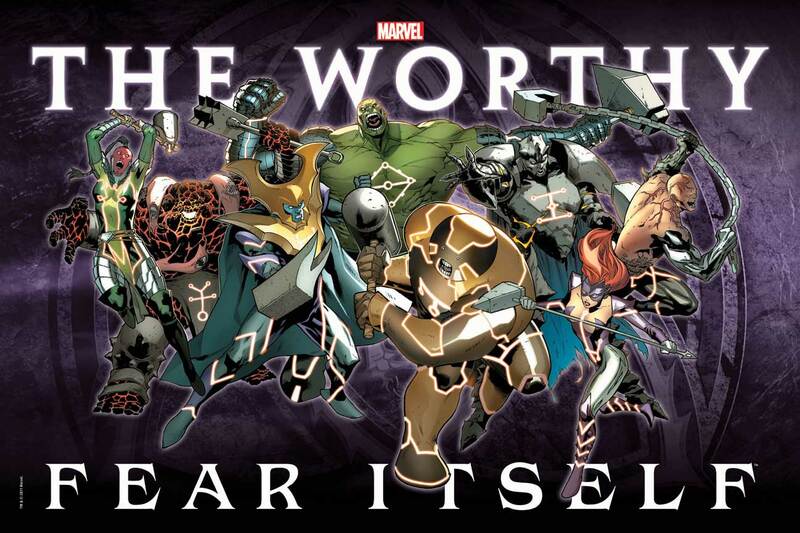 Marvel released the next (and "last" image) of the series, and it shows... THE HULK. Interestingly... there is NO mention of the word "DEFENDER". Only "OFFENDER". My take? Something happens with the HULK and the others need to gather to deal with this. IT'S EITHER IN YOU OR IT'S NOT. Among the things that have been getting my interest levels back up are these new series of promotional images from Marvel. A possible return to greatness for Stephen Strange? The "Mighty" being the heroic counter-force to the villainous (possessed by the evil "Serpent") "Worthy". Also, to add to the mystery of the solo images, are various key-words being used to comprise the forms of the hinted-at characters. 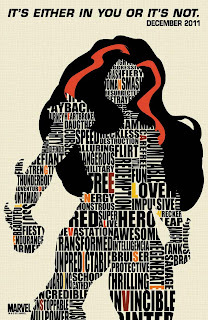 Words that describe each character and their unique powers/ history/ origins. And, added to that mystery are the appearance of selected colored individual letters. Thus far, 4 color groups are shown; RED, BROWN, ORANGE and YELLOW. 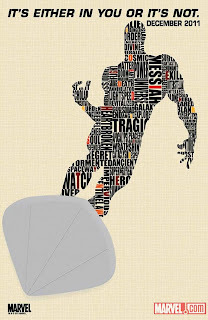 Taking the individual colored letters from each image could lead to four unique phrases? Also noted is the number "3". The Dr. 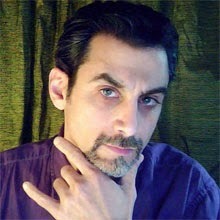 Strange image has a "3" where his chin would be (under the symbol for 'Infinity'). The Iron Fist image has a "33" big and bold on his chest. Depending on how many images are to follow, will the "3's" continue? Or other numbers that might add up to something? Or a magic number that bears some meaning to this mystery? See? This is a great way to add buzz to comics and generate anticipation of new launches. If they're talking about renewed interest... it is IN me. (THAT SAID... if there exist ANY actual promotional posters or prints of the DR STRANGE and/or MIGHTY images.. someone out there had better PLEASE contact me to make them available for purchase - or as a gift. No. Seriously. Drop me an email.). Collecting. Blogging. Blogging ABOUT Collecting. Getting the urge and energy and desire to share ones personal thoughts and swag with the world can be an uphill battle. I know that I have been remiss in my blogging duties as of late. Aside from a few errant posts and a few entries of importance, I've been A.W.O.L. here. That is not because of a lack of interest or desire. The SPIRIT is willing. The REST is weak. I've bemoaned my situation far too often here on my blog to get into it all again, suffice it to say, it's a struggle to find time, energy, money and justification to do so, BUT... I AM NOT STOPPING. There are times when the struggle can make you want to give up on things that you love. To stop caring about things you enjoy. Depression seeps in. Ennui stagnates. Time passes and it becomes harder to begin again. But sometimes, things can bring you back from the edge. Awaken your desires and remind you why you care so much and what got you started in the first place. Such things have been happening to me over the past few weeks. I've been reminded of the real reason I started this blog. - collectible swag that has been attracting my interest... which was the original purpose of starting this blog. - re-reading and reminiscing about the comics that got me started in collecting. - reading some new comics that have rejuvenated my love of the medium. - peeks into what is to come. I've got posts in the works on ALL of those topics. I'm still having a rough time keeping at it. That hasn't changed. But, I am desperately striving to continue without (m)any lapses. But, hey... I DO have one that is already typed out and posted - to appear at midnight tonight (so it'll be tomorrow's post). Thanks and come back soon.